When Steven arrived at Berlin’s celebrated Vau restaurant for a grilling and photo session with Germany culinary wunderkind, Kolja Kleeberg (pictured on the left), he found a kindred spirit on hand: Adam Perry Lang of Daisy May in New York. 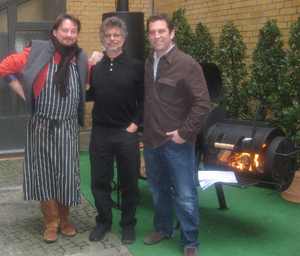 Here they are in the courtyard of Kolja’s restaurant in front of a Texas-style smoker built by Mike Ruchschatt of Rumo Barbeque. 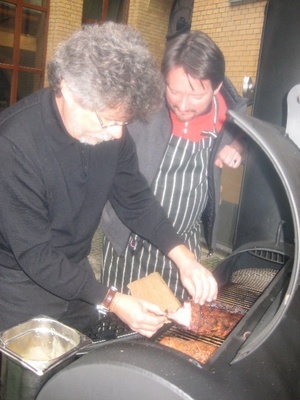 Kolja is an interesting guy–chef, TV star, musician (with a world class selection of Martin guitars), and he’s one of the few Germans who fires up his grill in wintertime. As for Adam, he’s the only classically French trained chef we know who wound up in barbecue and we wouldn’t be surprised if he brings his gospel of grilling to Germany. 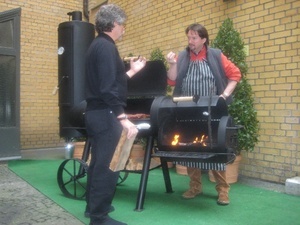 Here Steven and Kolja discuss Germany’s favorite fuel for grilling and smoking: beech wood. Steven show’s Kolja how to test ribs for doneness. You know the drill: when they’re tender enough to pull apart with your fingers, they’d done. Kolja agrees: ribs should not be so tender (a.k.a. overcooked) that they fall off the bone.